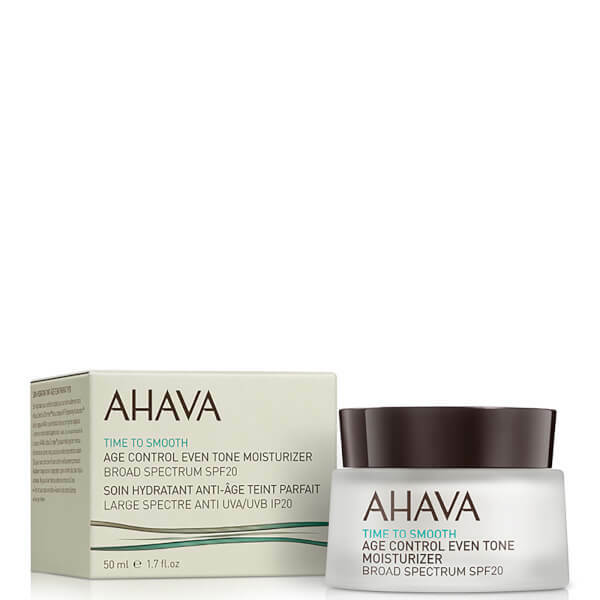 Improve skin tone and texture with AHAVA Age Control Even Tone Moisturiser SPF 20; a skin-brightening, multi-beneficial formula developed to address ageing concerns. Fortified with the brand's innovative VF Brightening™ Accelerator Complex, the lightweight, quick-absorbing cream minimises the appearance of fine lines, wrinkles and dark spots for a smoother, more refined complexion. Dead Sea minerals are combined with Dunalliela Salina Algae (a natural form of Retinol) to hydrate and nourish, whilst an antioxidant-rich URBAN Complex™ defends against environmental aggressors that can cause signs of premature ageing. Provides broad spectrum protection and leaves skin looking radiant and youthful without greasy residue. Use in the morning. Apply a dime-sized amount evenly all over face and throat.